This 18x24" poster was designed entirely in Illustrator 8 as a promotional piece for the new Stock Market Game Worldwide sponsored by the Securities Industry Foundation for Economic Education. The poster design uses a variety of blends and gradient meshes. 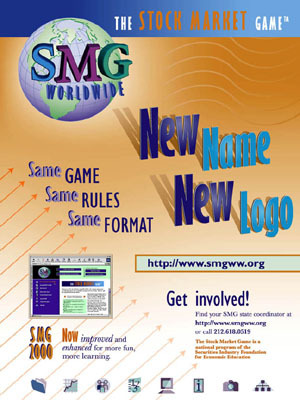 The icons at the bottom are also used as navigational icons in the SMG Worldwide website. I designed them in Illustrator 8 and then brought them into Fireworks 2 as vector objects in order to create the navigational buttons for the website.